I am in possession of about a dozen brand new oil filters of various types and sizes. I know that many of them do not fit anything I currently own. I know that if I did own one of the vehicles again that they fit, I would probably not remember that I had one already. They serve no practical purpose other than to adorn a shelf in the garage. I cannot throw them out, as they are new and perfectly functional. I console myself with thoughts like....one day, I am going to look them all up and put them on eBay. 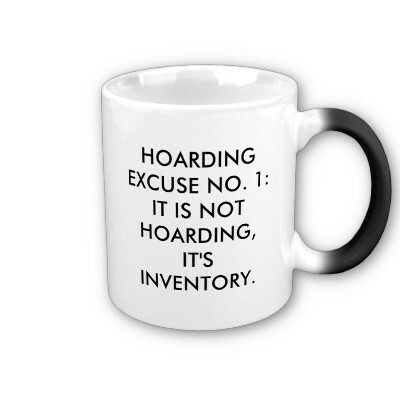 I am not trying to hoard them all, it is just the inertia. I am in possession of many dozen door mirrors. Many of them are broken or blemished in some way. A grub screw stripped, or a pivot mechanism shot so that the glass just flops around, seriously pitted chrome, etc. some of them were horrible "upgrades" by previous owners of vehicles I no longer own. Some of them fit vehicles that I currently own. Spares that I would never use because of their condition. I can't throw them out because they may be useful on a track car or a project, or as spare glass. I am in possession of more than a dozen motorcycle windshields. None of them fit anything I currently own. In fact two of them fit vehicles that I have never owned! They are mostly in good shape, so I can't throw them out. You never know when a hot rod Cafe project will need a cut down windshield from a BMW K12RS. They are bulky and difficult to store without scratching. Eventually, in about 30 years, there will be more than a dozen very scratched motorcycle windshields. Perhaps then the kids or grand kids will discard them. I am in possession of several sets of used spark plug wires. They were all removed from vehicles to eliminate them as potential contributors to some malady. Since I also replaced points, condensers, and coils (see above), they could all be perfectly fine. Or not. Best not to throw them out then. I am in possession of 2 BMW /2 bench seats which are shedding fine horsehair, a sheet metal replacement for the bottom front of a 356C, a multi-tool for a Norton, a pitted rear script from a Mercedes 230SL, a 1.7 914 motor, cracked turn signal lenses for a 69 Karmann Ghia, several not-so-good sets of /5 mufflers, rear door panels for a BMW 3.0CS, a dented CB750 tank, a tail section for an R100RS, a spare wheel for a Puma GTC, a broken speedometer for a 1966 VW Bus, multiple sets of airhead luggage, a deformed spoiler from a Mercedes 2.3 16V, a 914 rear decklid, etc, etc, etc.